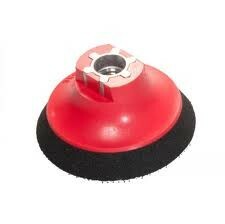 The Dodo Juice Mini Mount is a handy little backing plate used with 80mm or 100mm foam pads, for 'spot work' - i.e. polishing small areas, either because a bigger pad will be too unwieldy, or just because there's an isolated defect to remove. Like most other Dodo Juice backing plates, it has a 'hook and loop' fixing method and an M14 Euro thread.